The majority of women with fragility fractures have osteopenia rather than osteoporosis. In post hoc analyses of trials of alendronate and strontium ranelate, women with osteopenia had significant reductions in the incidence of fragility fractures and specific therapies may be mandated in women with osteopenia, as well as those with osteoporosis. Increasing numbers of fractures of the spine and hip occur in very elderly women and men over the age of 80, but in this age group it is often considered too late in life to start long-term specific therapies. In clinical trials of very elderly women, risendronate significantly reduced vertebral fractures and strontium ranelate significantly reduced vertebral, non-vertebral and symptomatic clinical fractures within 1 year of starting treatment. The indications for specific therapies for osteopenia and osteoporosis, as well as other measures for the prevention and treatment of fragility fractures, urgently need to be increased and widened. Osteoporosis is defined as a progressive systemic skeletal disease characterised by low bone mass and micro-architectural deterioration of bone tissue with a consequent increase in bone fragility and susceptibility to fracture. There is still uncertainty about the diagnosis and management of osteoporosis and osteopenia (low bone mass) and the medical management of low trauma (fragility) fractures, particularly in the very elderly. Recommendations from authorities including the National Osteoporosis Foundation of South Africa (NOFSA), National Osteoporosis Foundation of the USA (NOF) and National Osteoporosis Guideline Group of the UK (NOGG) are often not implemented.1-3 Responsibility for management moreover is divided between many different specialties. Osteoporosis and osteopenia (low bone mass) are now widely diagnosed by measuring bone mineral density (BMD) using dual energy X-ray absorptiometry (DEXA) of the upper femur and lumbar spine. 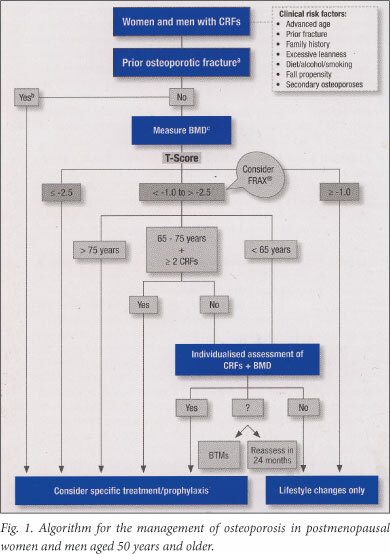 The criteria for the diagnosis of osteoporosis and osteopenia, however, vary between the different authorities with regard to the site at which BMD is measured and the number of bone sites included. The World Health Organization (WHO) designates 'osteoporosis' as a BMD 2.5 standard deviations (SD) or more below the young adult mean value for women (a T-score equal to or less than -2.5 SD in postmenopausal women). A BMD measurement of between -1 SD and -2.5 SD is designated as 'osteopenia' or 'low bone mass'.4 The WHO recommends that osteoporosis and osteopenia be diagnosed solely on the BMD measurement of the femoral neck, using the data of the National Health and Nutrition Examination Survey (NHANES) for Caucasian women aged 20 - 29 years as the normal reference range. The BMD of the femoral neck alone is recommended for diagnosing osteoporosis and osteopenia because of its higher predictive value for future fractures. Prediction of fracture risk is claimed not to be improved by using multiple sites for the measurement of BMD. The spine is not regarded as suitable, particularly in the elderly, because of the high prevalence of osteo-arthritis and spinal abnormalities that may affect BMD measurements. The International Society for Clinical Densitometry (ISCD) recommends that osteoporosis be diagnosed in postmenopausal women and men aged 50 and older if the lowest level of the T-score of the femoral neck or the total upper femur or the lumbar spine is -2.5 or less, and that osteopenia be diagnosed if the lowest level of the T-score is -1.0 or less but above -2.5.5 Measurement of the lumbar spine is based on the mean of L1 - L4 vertebrae, excluding any vertebra that is more than 1 SD from an adjacent vertebra but including a minimum of two vertebrae. A prior osteoporotic fracture of hip, humerus, pelvis, rib or wrist, irrespective of BMD. The female reference data for women are applied to the T-score in men as recommended by the WHO. NOFSA also recommends that all patients qualifying for a BMD measurement should have an X-ray of the spine or a DEXA-based vertebral fracture assessment, using the Genant semi-quantitative system (grade 1 - 3).6 A reduction in vertebral height of at least 20% or 4 mm is required to diagnose a vertebral fracture. The WHO combined these factors in a fracture risk assessment, the FRAX score (with or without BMD measurement of the femoral neck), to give a 10-year probability of the risk of future hip fracture or of a major osteoporotic fracture (clinical fracture of the spine, hip, forearm or humerus) in women and men 50 years of age or older (Table 1).7 A FRAX tool for assessing fracture risk probability is freely available online (www.shef.ac.uk/FRAX). The FRAX score is primarily recommended for identifying individual women or men for specific treatment of osteoporosis. 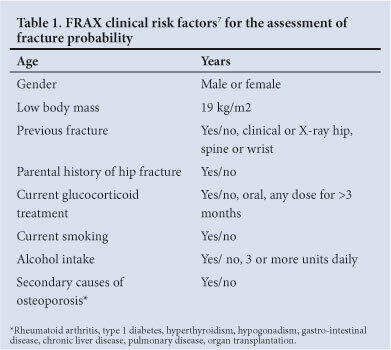 The FRAX score depends on the prevalence of fractures and the mortality in any group or country. It has been validated in the UK and Sweden and evaluated in other countries with differing fracture and mortality rates, including the USA. Modified FRAX scores and tables of fracture probability have been published for these countries.8,9 In the USA FRAX models for Asians, blacks and Hispanics have also been developed because their hip and osteoporotic fracture rates are lower than those in USA whites. No data are available for the fracture rates for different ethnic groups in South Africa. The 'Geoffrey Rose Prevention Paradox' applies to many chronic diseases, including osteopenia: 'a large number of people at small risk give rise to more cases than the small number who are at high risk'. In most countries less than half of women and men who sustain a fragility fracture have osteoporosis as diagnosed by DEXA measurements of BMD. The majority have osteopenia (low bone mass). In the NORA (Nordic Research on Ageing) study in the USA using peripheral BMD measurement of 149 562 postmenopausal women aged 50 - 104 years (mean 64.5 years), only 6.4% of women had a BMD of <-2.5 SD (associated with 18% of all fractures and 26% of hip fractures), but 45.3 % of women had a BMD of <1.0 SD (associated with 70% of all fractures and 77% of hip fractures).12 In the Rotterdam study of 4 878 women who had DEXA measurements of the femoral neck and were followed up for a mean 6.8 years, the rate of self-reported non-vertebral fractures was 44% with osteoporosis, 43.3% with osteopenia and 12.6% with normal BMD.13 In an Australian community study of 616 women who had DEXA measurements of the total femur, 124 women had one or more fractures. Of the women with fractures, only 26.9% had osteoporosis, 56.5% had osteopenia and 16.6% had a normal BMD.14 Most women and men who suffer from a fragility fracture do not have osteoporosis as defined by the WHO. Therefore, assessment of fracture risk and diagnosis and treatment should not be limited to those with osteoporosis but should include all patients with osteopenia and all patients with clinical risk factors for fracture. Women and men with osteopenia are generally considered to be at low risk of fracture. They are often managed with advice about calcium and vitamin D supplementation and lifestyle changes, but are not given any specific therapy. Most clinical trials of specific therapies for osteoporosis and osteopenia have focused on patients with osteoporosis and/or the presence of hip or vertebral fracture. Few randomised controlled trials have been performed on patients with osteopenia, but some have included osteopenic patients allowing post hoc analyses. In the Fracture Intervention Trial (FIT) 1 and FIT 2 trials of patients with osteopenia of the femoral neck with and without vertebral fractures, alendronate decreased the risk of radiological fractures (relative risk (RR) 0.48, 95% confidence interval (CI) 0.41 - 0.81) and of clinical vertebral fractures (RR 0.41, 95% CI 0.19 - 0.76).16 In the Spinal Osteoporosis Therapeutic Intervention SOTI) and TReatment Of Peripheral OSteoporosis (TROPOS) trials in women with osteopenia of the lumbar spine, strontium ranelate reduced the risk of vertebral fracture in women with no prevalent fractures (RR 0.41, 95% CI 0.17 - 0.99) and in women with prevalent fractures (RR 0.62, 95% CI 0.44 - 0.88).17 In women with osteopenia at both the lumbar spine and femoral neck, treatment with strontium ranelate reduced the risk of fracture (RR 0.48, 95% CI 0.24 - 0.96). Specific drug treatment appears to be effective and is justified to reduce the risk of further fractures in patients with osteopenia, particularly those with prevalent fractures. Very elderly women and men (aged 80 years and over) are the fastest-growing segment of the population. About 25 - 30% of the population burden of all fragility fractures is in women and men over 80, who are at high risk for fracture, particularly non-vertebral fracture, because of their high prevalence of osteoporosis and osteopenia and high incidence of falls. After a hip fracture approximately 20% of patients do not survive more than a year and 50% do not regain their previous level of independence. Vertebral fractures are associated with back pain, height loss, kyphosis and functional disability. The prevalence of vertebral deformities increases from 5 - 10% in women in the 50s to 45 - 55% of those in the 80s. Only a proportion of older women and men with osteoporosis or osteopenia receive specific treatment. Some clinicians may consider that patients over 80 years are too old, or that it is too late to significantly alter the course of the disease. Based on pooled data of 1 392 women aged 80 or over from the HIP, VERT-MN and VERT-NA trials, risendronate resulted in a 44% reduction in vertebral fractures but not in non-vertebral fractures.18 In 1 488 women between 80 and 100 years of age from the SOTI and TROPOS trials and followed up for 3 years, strontium ranelate reduced the risk of vertebral, non-vertebral and clinical symptomatic fractures within the first year by 59% (p=0.002), 41% (p=0.027) and 37% (p=0.012), respectively.19 At the end of 3 years vertebral, non-vertebral and symptomatic clinical fractures were reduced by 32% (p=0.013), 31% (p=0.011) and 22% (p=0.040), respectively. Strontium ranelate was reported to be well tolerated and as safe as in younger patients. Women and men are therefore never too old for treatment, and it is never too late to treat those with osteoporosis or osteopenia, particularly when they have a fragility fracture. Patients with osteoporosis and osteopenia are treated by general practitioners and specialists from various disciplines including orthopaedics, rheumatology, gynaecology, geriatrics and endocrinology. Knowledge and understanding of the diagnosis and treatment of osteoporosis and of fragility fractures is increasing and new treatment options are being developed. Few specialties require training in osteoporosis and metabolic bone diseases for higher professional qualification. A good case can be made for the establishment of local groups, including generalists and specialists who are especially interested in osteoporosis, to agree on referral practices and treatment based on local resources. In large hospitals an 'osteoporosis clinic' including different disciplines may facilitate diagnosis and management. There is little doubt that the care of women and men with osteoporosis or osteopenia and those with fragility fractures, particularly the very elderly, can be enormously improved.